Strictly speaking, all fungi should be classified according to their method of sexual reproduction. In many cases this is possible, allowing us to recognize several groups of fungi. Fungi that are encountered most often or exclusively in the asexual condition create special problems and are discussed separately as anamorphs. The text below is a very brief discussion of fungal classification and may be sufficient as a quick introduction. For a more detailed discussion look through our pages dealing with fungal diversity and classification. The Chytridiomycota, or "chytrids" as they are commonly called, are a group of mostly unicellular fungi occurring in a variety of habitats ranging from soil and roots to the rumens of cows and deer. 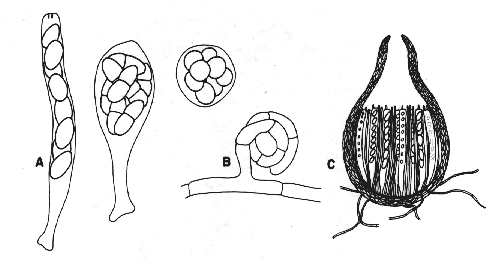 Asexual and sexual spores are produced in sporangia and escape as zoospores (swimming cells). Because of their basically non-hyphal nature and often unusual requirements for growth, the Chytridiomycota are seldom encountered as moulds. The individual in the photograph above right is perched on top a grain of pine pollen. This is in fact an easy way to collect and examine chytrids. Many plants, including pine and other conifers, produce large amounts of pollen over a short period of time. This pollen can be gathered in small bottles and dried for later use. Sprinkle the pollen very sparingly over the surface of some pond water in a dish. Over the next few days examine the pollen under a microscope for evidence of chytrids. Members of this group all reproduce by oogonia eggs. The hyphae have few or no cross-walls (septa) and thus appear as long, clear tubes. If a hypha is broken, most of the contents run out. 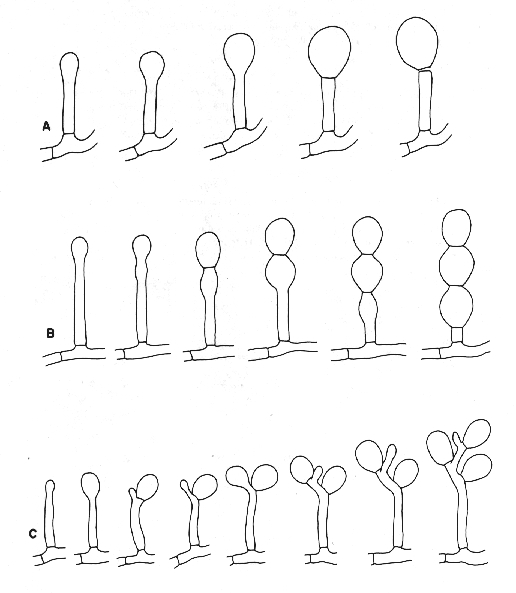 Many oomycetes reproduce asexually by zoospores, which are motile and can swim quite rapidly. Because of their motile zoospores, oomycetes commonly require water for reproduction and are often encountered in water or wet soil. An easy way to see oomycetes is to heat a few sesame seeds until they "pop" and then float three or four on the surface of some pond water in a dish. After a few days the oomycetes with form a thick white growth around the seeds. If you watch there carefully you may be able to observe the release of zoospores. Figure 1. Oomycota. A: zoosporangia of Saprolegnia sp. 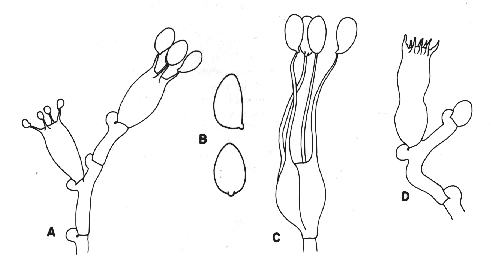 B: zoosporangia of Pythium sp. C: oogonia and antheridia of Saprolegnia sp. Oogonia of Saprolegnia sp., isolated from the Ramioul Cave in Belgium. As their name implies, these fungi all produce zygospores. They resemble the oomycetes in having hyphae that usually lack cross-walls or septa, but differ in lacking motile spores. 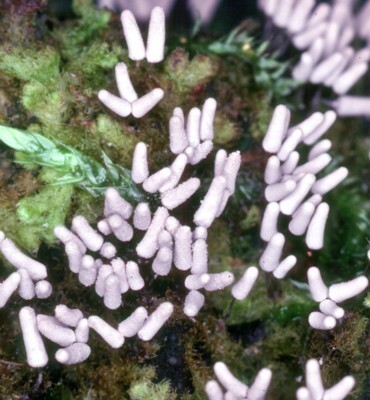 Asexual reproduction is by sporangia or conidia. The members of this group are usually terrestrial and will be encountered only occasionally in aquatic conditions. Zygomycetes are easy to observe. They will invariably grow if soil is sprinkled over strawberries or raspberries. Any attempts to isolate fungi from soil (see chapter on cultivation) will reveal numerous zygomycetes. All ascomycetes have ascospores borne inside asci. The hyphae always bear numerous septa. Asexual reproduction is by conidia that always lack motility. Although most ascomycetes are terrestrial, some occur in freshwater or marine habitats. Ascomycetes are everywhere and can be collected year around. The minute black dots on rotting wood and leaves or the little cups on lichens will often prove to be perfect examples. Figure 3. 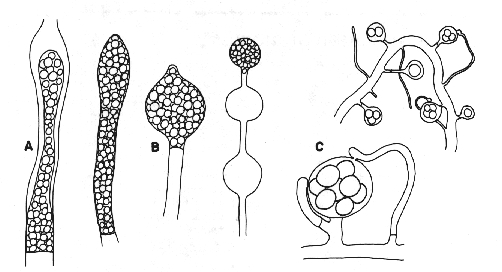 Ascomycetes A: three kinds of asci: cylindrical, clavate, and spherical. B: initial phase of sexual reproduction. C: cross-section of a flask-shaped perithecium bearing cylindrical asci. This large group, which includes mushrooms and puffballs, is characterized by the presence of basidia and basidiospores. Like ascomycetes, to which they are related, basidiomycetes have hyphae with septa and lack motile spores. The hyphae of many basidiomycetes bear characteristic swellings, called clamp connections, that play a specialized role in nuclear migration. 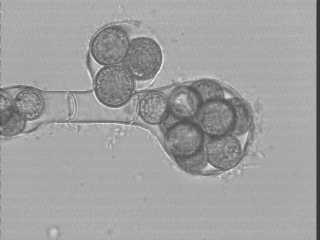 Asexual spores, when formed, are produced as conidia. Most basidiomycetes are terrestrial. Figure 4. Basidiomycetes A: four-spored undivided basidium (holobasidium); note the clamp connection at each cross-wall. 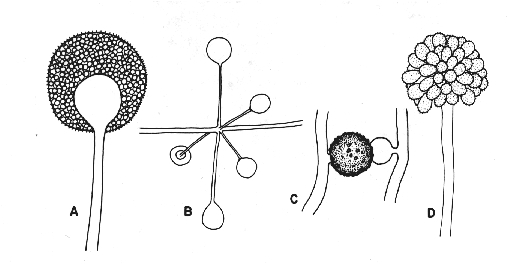 B: two typical basidiospores, the upper one in side view and the lower in front view. C: a four-celled, cruciate basidium typical of many jelly fungi. D: eight-spored holobasidium typical of species of Sistotrema; the spores have been discharged. The figure at right, shows the role of a clamp connection in facilitating nuclear migration. 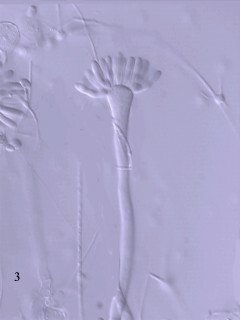 This group comprises the large number of fungi known to reproduce asexually by conidia and is by far the most important in a study of moulds. The asexually reproducing structures of a fungus are called anamorphs, which, together with the sexually reproducing structures or teleomorphs, make up the holomorph or whole fungus. Until the recent advent of a practical genetic methodology the numerous fungi known only as anamorphs could not be classified confidently with the ascomycetes or basidiomycetes to which they undoubtedly belonged. Mycologists have long used a system of classification that allows anamorphs to be named separately from the holomorph of which they form a part. As a consequence, many fungi could have two different names. For example, the name Eurotium repens pertained to a holomorph with both ascospores and conidia, whereas Aspergillus repens pertained only to the anamorph of the same fungus. Current advances in nucleotide sequencing now allow quite accurate taxonomic placement of species, and as of 1 January 2013 the dual system has come to an end. We now adhere to the more intuitive concept of "One Fungus - One Name". Digging out from more than a century of double names will take time and mycologists temporarily use the old system, but in an admittedly informal sense. Once all the doubly-named species have been sorted out mycologists can breathe a sigh of relief. 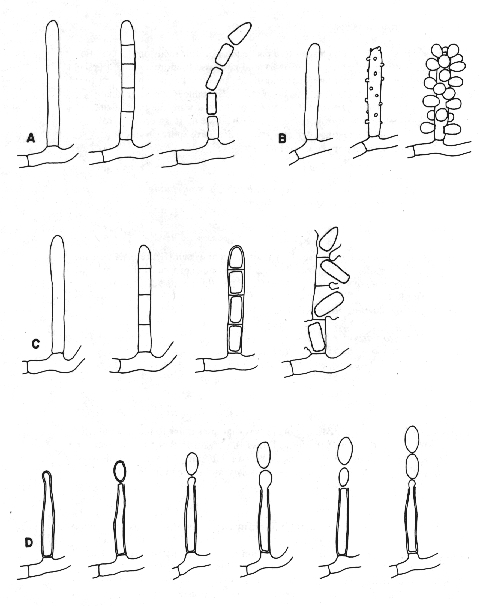 Anamorphs show considerable structural diversity and can be classified or described according to three attributes: (1) the method of conidium production (conidiogenesis), (2) the locus of conidiogenesis, and (3) the sequence of conidiogenesis (See Figures 5 and 6). Production of a conidium involves the transformation of part of a cell into a separable spore. 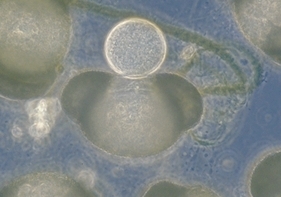 Sometimes a hypha or cell becomes separated into one or more segments by septa. The separate cells then thicken, swell, and finally separate. This kind of conidiogenesis, where the septa appear before the conidium is initiated, is called thallic (Figure 5A,C). When the new conidium is initiated, begins to swell or thicken, and then is cut off by a septum, the conidiogenesis is called blastic (Figures 5B, D;6). When the wall of the conidium is continuous with the cell that produced it, it is called either holothallic (when thallic) (figure 5A) or holoblastic (when blastic) (figure 5B). When only the inner walls of the conidium-bearing cell are involved in conidiogenesis, the prefix "entero-" is used, resulting in the terms enterothallic (figure 5C) and enteroblastic (figure 5D). Although enterothallic types are rare, enteroblastic types are probably the most common of all and are represented by the ubiquitous phialide. Conidiogenesis usually can be traced to a particular point or locus on the conidiogenous cell. If this point remains stationary and gives rise to more conidia it is said to be stable (figure 5D). If subsequent conidia are produced at new points on the cell the conidiogenous locus is said to be dynamic. Dynamic loci may gradually elongate and be called progressive (figure 6C), or move toward the base of the conidiogenesis cell and be retrogressive (figure 6B). Usually it is necessary to examine several cells to "reconstruct" the loci of successive spore productions. If only a single conidium is produced on a conidiogenous cell (figure 6A), we can hardly speak of a sequence. If, however, more than one is produced they can occur either simultaneously (figure 5A, B, C) or serially (i.e. one after another) (figures 5D; 6B, C). A: holothallic; the multiple conidia are produced simultaneously. B: holoblastic; the multiple conidia are produced simultaneously. C: enterothallic; the multiple conidia are produced simultaneously. D: enteroblastic; the multiple conidia are produced serially from a stable locus. A: holoblastic; the conidium is solitary. B: holoblastic; the multiple conidia are produced serially from a retrogressive locus. In routine work we often encounter organisms that are similar to moulds but do not fit our strict definition of the term. Either the organism is not filamentous or it is filamentous but not strictly a fungus. We can put four groups of organisms into this category; bacteria, actinomycetes, yeasts, and slime moulds. Bacteria represent a very ancient group of organisms, perhaps as old as four billion years. Colonies of bacteria are composed of minute spore-like cells that together form a slimy mass. Such colonies never contain hyphae and are thus easily distinguished from those of true moulds. Bacterial cells, rarely more than 1 um in diameter, are difficult to examine, even with a good microscope, and are best seen when stained. Many bacteria are motile and swim vigorously. These organisms are usually classified as bacteria but have filaments like fungi. The filaments are seldom more than 1 um in diameter, however, and are thus considerably narrower than those of moulds. Streptomyces, the only actinomycete genus commonly encountered as a "mould", produces grey to brightly coloured powdery colonies, usually with a soil-like odour. Yeasts are true fungi, but in lacking hyphae cannot be classed as moulds. They resemble bacteria in forming pasty or slimy colonies of spore-like cells, but differ in having these cells much larger, usually 2 um or more broad. Reproduction of yeasts is usually by budding, a process where a smaller cell appears to bubble slowly out of the parent cell. Slime moulds normally occur on logs and other natural materials but occasionally occur in the laboratory as "moulds". Cellular slime moulds, the most likely to appear in the laboratory, have creeping amoeba-like cells during part of the life cycle and sporangium-like structures in another. They most closely resemble members of the zygomycete genus Mucor, but differ in their complete lack of hyphae. Myxomycetes, another group of slime moulds, occur on rotting wood and vegetation in a great variety of habitats. The ones in the photograph at right were growing on an old moss-covered log.